Puntius sp common name odessa barbs or also known as the scarlet barb. They grow up to 17 cm / 3 inches fully grown. 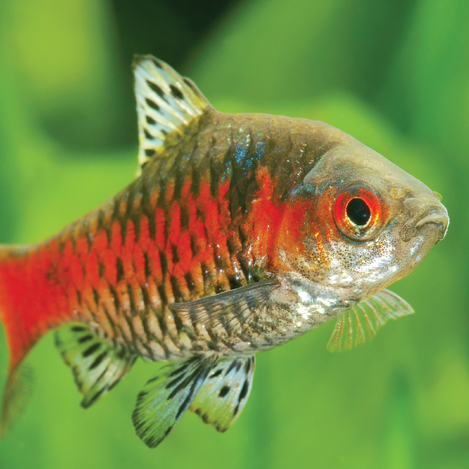 They live in water parameters of PH range 6.0-7.5 and temperatures of 24-27 Celsius / 74-80 °F. The odessa barbs are a semi aggressive fish and can be very nippy, so we recommend not to mix them with fish with flowing fins ( do not mix with fighting fish or guppies ). 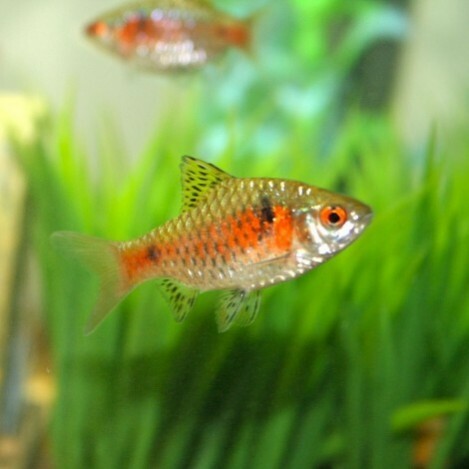 They are a playful fish so mixing them in groups is best, and with other barbs. Odessa barbs are greedy so will eat any food you drop in the tank. They will eat flake, small pellets, and granular foods. Also with treats of freeze dried, frozen or live foods. Odessa barbs will eat flake, pellets, and granular foods, also live and frozen foods as a treat. Either sink the food or float it they will eat it anywhere you put it.